Burning Spear shines the spotlight on St. Louis! St. Louis comrades with members of the African community take a quick pic after a long day of Spear selling! St. Louis – It’s been a little over a month since Themba Tshibanda, longtime member of the African People’s Socialist Party’s Department of Agitation and Propaganda and title holder of Top Spear-seller, was deployed into St. Louis to get the Spear out to the community and train our Comrades on how to sell, sell, sell! While he has been there, the Spear has been present at many different events and outreach opportunities, but closing out February and entering the month of March has proved the most fruitful so far. On a Saturday, Themba organized an outreach dream team consisting of members from the St. Louis branch of the International People’s Democratic Uhuru Movement (InPDUM), including local President Maisha, Outreach Coordinator Tiffany, InPDUM’s youngest member Naila who also serves as the local Membership Coordinator, and another young force named Rakia. They met up at O’Fallon Park, which is located in the heart of an African working-class community, that’s home to one of the Party’s recent projects─ a part of the Black Power Blueprint, the new Uhuru House. It was an unseasonably warm day, so Africans filled the park to enjoy it. They were met by the people, who offered warm smiles and embraces, as they walked from one group of Africans to the next bearing “Know Your Rights” cards and The Burning Spear newspaper. Comrade President Maisha played the role of Agitation and Propaganda, capturing the day with pictures and video recording of the interactions with the people. African Internationalism to everyone around, setting an example for all those who looked on in admiration. With her profound pitch, she won many people, young and old, to purchase The Spear. Comrade Tiffany Cherry showed she was a force to be reckoned with her unique, almost effortless way of gathering the contact information from the people. She put out the line and spoke the language of the people. The clipboard and pen were hot items during this outreach session. Concluding the day, the team sold 30 Spears, gained 30 enthusiastic contacts, distributed 50 “Know Your Rights” cards, developed field experience for newer forces, and won unity from the community around the Party and its vision for self-determination in the form of the Black Power Blueprint. The Comrades didn’t stop there, however! The following week, the local InPDUM branch held a meeting to discuss selling a total of 800 Spears during the month of March. The Comrades are committed to being out on the streets, in the community, for hours at a time selling as many Spears as possible to make this goal happen! In this process, Comrades will also be equipped with the proper training to continue the work of selling The Spear, keeping it burning on the streets of St. Louis where the Party and InPDUM are growing! 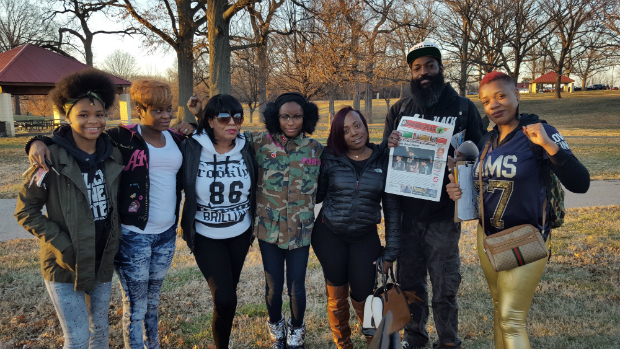 The Spear shines a spotlight on St. Louis and salutes our Comrades Themba, and the entire St. Louis InPDUM branch: Maisha, Naila, and Tiffany! We Must Organize the People, Now More than Ever!